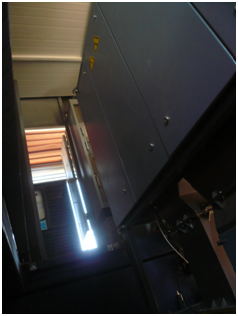 Dynamic Machinery recently completed a ±200 tonnes per hour diamond sorting plant. Sortech supplied the three Bourevestnik sorters that were used to handle the volume. Two sorters were used as primary sorters and the third sorter received the concentrate of the first two to perform the concentrate sorting. 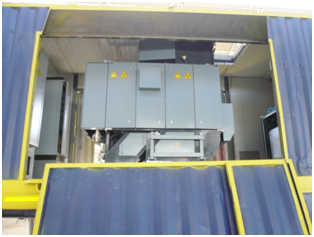 The aspect that made the project remarkable is the fact that the whole plant fitted into one 12m shipping container. The sides of the container are folded in during transport, but opens up when the machines are in operation. 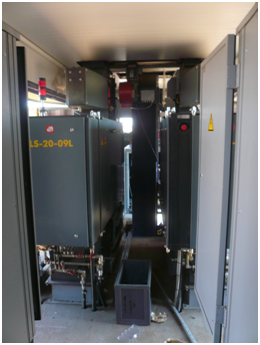 The extra space allows for easy operation and maintenance of the equipment. 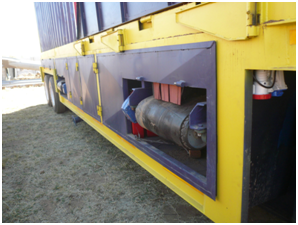 The container was also mounted onto a 2-axle trailer to make the plant easy to transport. The rest of the equipment to support the three sorters includes a water chiller, a 10 Bar compressor, control computer, UPS with batteries, elevator and various conveyors. The divider split the container into the area that is air conditioned and the section that should be open for air exchange. 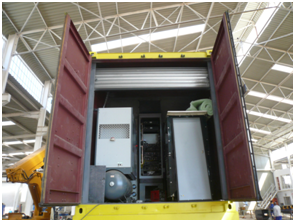 Roller doors with mesh allow the air exchange at the back of the container without the security of the plant being compromised. The air conditioner and padded sides provide the proper working conditions for an operator of the plant to be secured inside while the plant is in operation. 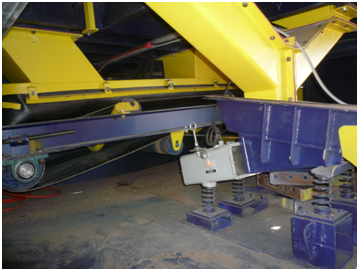 Even the chutes to transfer the material from the internal conveyors to the outside tailings conveyor are used to close all access to the working parts of the machines, since security is a high priority. The design was also optimised to facilitate the cleaning of the equipment in the areas where spillages may have occurred. Space was always limited and had to be used efficiently with fold-up walkways and steps. All pipe work to connect the sorters to the water supply and compressed air was done as part of the total working unit. 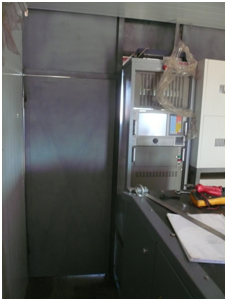 All the electrical work is connected to a MCC that facilitates and automate the control of all electrical equipment. The plant is operated by a PLC controller. The commissioning of the plant happened at the premises of Dynamic Machinery to test and optimise all the different aspects of the plant. 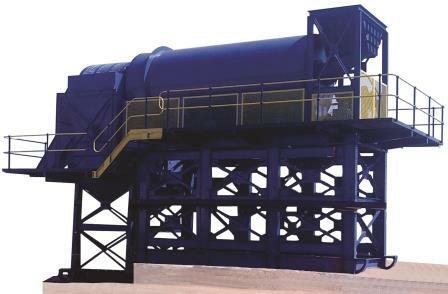 Dynamic Machinery is proud to have designed and built the ground breaking development in sorting technology. As 2015 is coming to a close, we would like to take the time to thank each and everybody that made the year special. Thank you to all our loyal clients for their support and business over all these years. We appreciate the support and look forward to continue the mutual support in the new year. Be Assured of our continues commitment to all our clients. We also would like to thank our suppliers for their support and products to enable us to provide machines of such high standards. Ore sorting is the original concentration process, having probably been used by the earliest metal workers several thousand years ago. It involves the appraisal of individual ore particles and the rejection of those particles that do not warrant further treatment. Hand sorting has declined in importance due to the need to treat large quantities of low-grade ore which requires extremely fine grinding. Hand sorting of some kind, however, is still practised at some mines, even though it may only be the removal of large pieces of timber, tramp iron, etc. from the run-of-mine ore. Electronic ore-sorting equipment was first produced in the late 1940s, and although its application is fairly limited, it is an important technique for the processing of certain minerals (Sassos, 1985; Salter and Wyatt, 1991; Sivamohan and Forssberg, 1991; Collins and Bonney, 1998; Arvidson, 2002). Sorting can be applied to pre-concentration, in which barren waste is eliminated to reduce the tonnage reporting to the downstream concentration processes, such as in uranium or gold ore sorting, or to the production of a final product, such as in limestone or diamond sorting. The ore must be sufficiently liberated at a coarse size to allow barren waste to be discarded without significant loss of value. Pre-concentration by sorting is seen as a method of improving the sustainability of mineral processing operations by reducing the consumption of energy and water in grinding and concentration, and achieving more benign tailings disposal (Cutmore and Ebehardt, 2002). Many rock properties have been used as the basis of electronic sorting, including reflectance and colour in visible light (magnesite, limestone, base metal and gold ores, phosphates, talc, coal), ultraviolet (scheelite), natural gamma radiation (uranium ore), magnetism (iron ore), conductivity (sulphides), and X-Ray luminescence (diamonds). Infrared, Raman, microwave attenuation, and other properties have also been tested. Electronic sorters inspect the particles to determine the value of some property (e.g. light reflectance) and then eject those particles which meet some criterion (e.g. light vs dark rocks). Either valuables or waste may be selected for ejection. It is essential, therefore, that a distinct difference in the required physical property is apparent between the valuable minerals and the gangue. The particle surfaces must be thoroughly washed before sorting, so that blurring of the signal does not occur and, as it is not practical to attempt to feed very wide rock size ranges to a single machine, the feed must undergo preliminary sizing. The ore must be fed in a monolayer, as display of individual particles to the sorting device must be effected. Photometric sorting is the mechanised form of hand-sorting, in which the ore is divided into components of differing value by visual examination (Arvidson, 2002). The basis of the photometric sorter (Figure 1) is a laser light source and sensitive photomultiplier, used in a scanning system to detect light reflected from the surfaces of rocks passing through the sorting zone (Figure 2). Electronic circuitry analyses the photomultiplier signal, which changes with the intensity of the reflected light and produces control signals to actuate the appropriate valves of an air-blast rejection device to remove certain particles selected by means of the analysing process. The sorter is fully automatic and can be attended by one operator on a part-time basis. We at Dynamic Machinery invite you to visit our factory and see first-hand how we can benefit your company with the products that we build and supply. We have extensive knowledge in the electronic mineral sorting field and request you to put us to the test. Arvidson, B. (2002). Photometric ore sorting, in Mineral Processing Plant Design, Practice and Control, ed. A.L. Mular, D.N. Halbe, and D.J. Barratt, 1033-1048 (SME). Collins, D.N. and Bonney, C.F. (1998). Separation of coarse particles (over 1 mm), Int. Min. Miner., 1, 2(Apr. ), 104-112. Cutmore, N.G. and Ebehardt, J.E. (2002). The future of ore sorting in sustainable processing, Proc. Green Processing, Cairns, May, 287-289 (Aus. IMM). Salter, J.D. and Wyatt, N.P.G. (1991). Sorting in the minerals industry: Past, present and future, Minerals Engng., 4(7-11), 779. Sassos, M.P. (1985). Mineral sorters, Engng. Min. J., 185(Jun. ), 68. Sivamohan, R. and Forssberg, E. (1991). Electronic sorting and other pre-concentration methods, Minerals Engng., 4(7-11), 797. Wills, BA and Napier-Munn, TJ (2006). Mineral Processing Technology - An Introduction to the Practical Aspects of Ore Treatment and Mineral, 373-374. 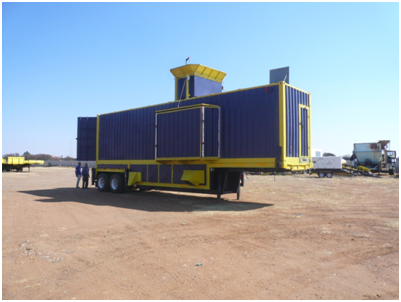 At Dynamic Machinery we are proud to deliver an upscale solution for a diamond mine. 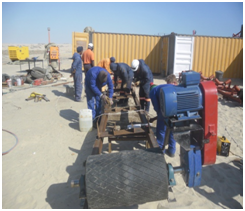 Our client wanted a custom built solution for the conditions typical to their diamond mine. 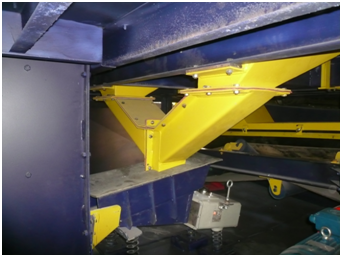 The plant consists of a 3m3 feed bin with additional spray bar to facilitate a stable and smooth feed into the scrubber. 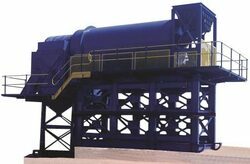 The scrubber diameter is 2.4m and a length of 6m. 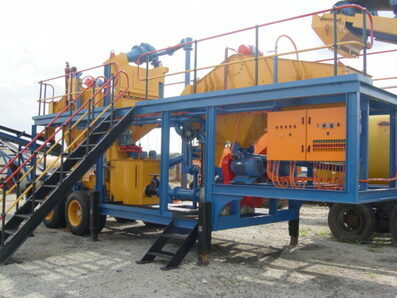 The scrubber has a retainer ring to provide additional mixing and cleaning of the material. The scrubber breaks the clay and loosens the finer material of the feed. The roll-sieve is used to remove the oversize material from the feed and ensure the proper size is fed to the vibrating screen. The 6 x 16 double deck screen is removing the sand from the material and other finer particles. The rest of the middlings are used for further sorting through various other stages. The spraying of water is used very effectively to wash the material and remove the very fine slime. The additional preparation, cleaning and screening section of the mine allows for a lot more viable material to the rest of the plant. The result is a much more effective plant with higher production volumes. The size of the machine is not common in the diamond industry. The 8m high structure is truly on a different scale for diamond digging. The modern DMS plant is a very sophisticated piece of equipment. You need a proper working knowledge to operate your DMS to its proper operating capacity. Let’s look at various aspects of a DMS plant in operation. A DMS is a Dens Medium Separator that separates material based on the specific gravity (SG). The density of the medium determines if the material will sink or float depending on the material’s density. Various media can be used, but the common ones are Ferrosilicon (FeSi) and Magnetite. The most important thing to remember when you operate your DMS is: TESTING, TESTING AND TESTING. If you measure something you know what the results are. If you are not testing your feed, product and tailings, you will be driving your DMS blindly. o Ensure the correct grading of your material is as expected. Alternatively you would have to adjust your feed rate accordingly. o Are you losing too much product in your tailings? Adjust your cut point and the same for too little. o Are you getting too low grade? Use these readings and plot them on a graph so that you can see when things are running like they should or not. I assume that the product is the sinks from the cyclone for the detail below e.g. Copper, Manganese and Diamonds. If you are processing products like coal you would have your product as the floats in your cyclone and then you would do the reverse of what is described below for the cut points. o The material will clog the pipes further in the process, if the material that you need to mix in the mixing box is too large. o Investigate your sizing screen for damage to the panels. Somewhere is a hole that lets the larger size of material through. o If the material is too fine you will see that the fines are contaminating the FeSi. o Inspect the aperture of the screen panels of the prep screen and ensure that they are not blocked. o You can also increase the water on the sprayers of the prep screen to remove the amount of fines from your run of mine. It will also help to unblock the smaller apertures and keep them open. o Adjust your SG cut point so that you are getting less product, but at a higher grade. o Also check that the content of your run of mine is of such grade that you can achieve that required grade. o You can adjust the cut point on your cyclone lower so that more product comes through at a lower cut point. o If your contract states that you will get paid according to the tonnes at a specific grade then you need to ensure a correct grade for the client by having the correct cut point. o Selective mining can be performed, but be careful of the risks involved. Be certain where the most cost effective grade is for your operation. Optimise the volume of product at a specific price and cost, so that your profit is the most. o Check that you are feeding enough tonnes per hour and prevent fluctuations of feed rate. Keep the flow steady. o Check that your run of mine is of a proper and acceptable grade. o Check your SG cut point that it is not too low. o Check your feed at the run of mine end that it is not too fast. o Check that all the aspects are running fine until you set the new optimised level as the new standard level. Never run without a pressure gauge and ensure that it is accurate. o Check for cracks leaks or holes in the pipes and cyclone. o Check that the pump running correctly and all the V-Belts have the correct tension. o Ensure that there are enough feed to the mixing box and the FeSi level is high enough. o Check the valve settings that the feed is not choked too much. o Ensure the level of the FeSi is at the overflow, so that the mixing is sufficient. The mixing box should always have enough FeSi so that the overflow ensures the correct level is maintained. o Ensure that the Saunders valve is at the correct setting. o Check the density of the FeSi medium with a Macy scale to make sure the density controller is functioning correctly. o Make sure the controller is set correctly. o Do a manual SG test to check the setting of the SG on the controller. o Ensure the sprayers on the Washing screen are not spraying water into the concentrated FeSi chute, but directs all the washed FeSi into the dilute side of the wet drum magsep. o Ensure that there are no panels lose or missing on the screens. o Ensure that the apertures of the panels are not blocked on the screens. o If you have too little water on the sink/float screen then FeSi will stick to the product and be lost. Check to see if you can increase the volume of water sprayed on the panels of the sink/float screen. o Ensure that the drum is in the correct setting as per the manufacturer’s manual. If the FeSi is not picked up at the drum, it is lost to the slime dam. o Ensure all the flush points are tightly sealed. No spillages should occur. § Check if the inlet filters are open and not blocked. § Ensure that no water is leaking before it gets to the plant. § Endure that the speed of the motor or the condition of the pump is up to standard. § Use the pressure gauge to monitor the pressure between 3 Bar and 5 Bar. o Increase the water to the washing screens in the case where the washing is not cleaning the material effectively. § You can also increase the flow rate of the water to the sprayers to ensure better washing of the product or material. § Do not adjust the speed of the screen to move the material slower, because it will limit your overall flow rate and can cause various other problems. o Reuse some of the water captured under the screens for further use in the scrubber. § Save on the overall amount of water used by supplementing clean water with grey water from the screens. Use a filter in the recycle pipeline to remove the majority of the solids in suspension, if necessary. o Spillages will be visible around the lips of the under pans of the screens mainly. § Check the pump speed to ensure it is not running too fast. § Reduce the supply to what is necessary to be effective by choking the pump or adjusting the VSD on the motor. o Product or material can be displaced wrongly and lost so that the product and material gets mixed by too much force in the water. Ensure the separator on the sink /float screen is high enough to keep the material from spilling over to the other compartment. o The SG controller of the DMS will need to add a specific amount of water to control the SG at the set cut point. Keep your critical spares list up to date. Ensure that you have those parts in stock. These parts will enable you to recover from a stoppage so much quicker and more effective. Dynamic Machinery has the facility to keep emergency spares of hard to find items on your behalf as part of your contract. There is no replacement or excuse for not doing preventative maintenance. The small amount of checking and maintenance on the correct time will eliminate costly delays and stoppages of production. Record the maintenance and check which parts of the plant needs maintenance more often. A small effort on maintenance can save a lot of effort on repairs! Check the oil and grease of the moving parts. You will see where the wear and tear is a problem, so that you have time to rectify it before something breaks. Use your checklist before you start and after you completed a run to ensure you know your plant inside and out. If any of these points or other points is unclear, please feel free to contact us at Dynamic Machinery. We will help gladly. At Dynamic Machinery we have seen that our clients on average gets better result from their standard DMS plants, because their operators are better trained and supported. We are supplying a full solution, because we want our clients to produce as much quality product in the shortest possible time. Dynamic Machinery is prepared to assist DMS owners to get the most out of their existing DMS plant. Welcome to the new website of Dynamic Machinery. Please look around and if you need anything simply contact us.